Venezuela Spiraling Towards Possible Hyperinflation | One Blog: To Rule Them All! Hugo Chavez took the Venezuelan Presidential office in 1999. During his tenure as President, he was able to use Venezuela’s abundance of natural resources (oil) as a means of securing the financial stability of his people. Chavez’s socialist policies, aimed at redistributing wealth, have never been perfect and have always been blatantly corrupt. Nevertheless, during his tenure as President, Chavez was able to reduce poverty and inequality substantially while also cutting the unemployment rate by half (according to The World Bank). Chavez’s heroics are short lived. The socialist engine of production in Venezuela merely enables its citizens to receive slices (small slices) of the economic pie. The problem is that it doesn’t empower the citizens to cook the pie. Enter Nicholas Maduro. The bus driver, who managed to rise to the ranks of a political leader. Maduro was eventually handpicked by Chavez to succeed him as President. Maduro won a 2013 Presidential election against Henrique Capriles by a 1.49% margin. Capriles demanded an audit of all the votes in the closest election since 1968, which of course was impossible according to the “election council”. Capriles (Governor of Miranda) defines himself as, ” A center-left ‘progressive’ follower of the business-friendly but socially-conscious Brazilian economic model”. 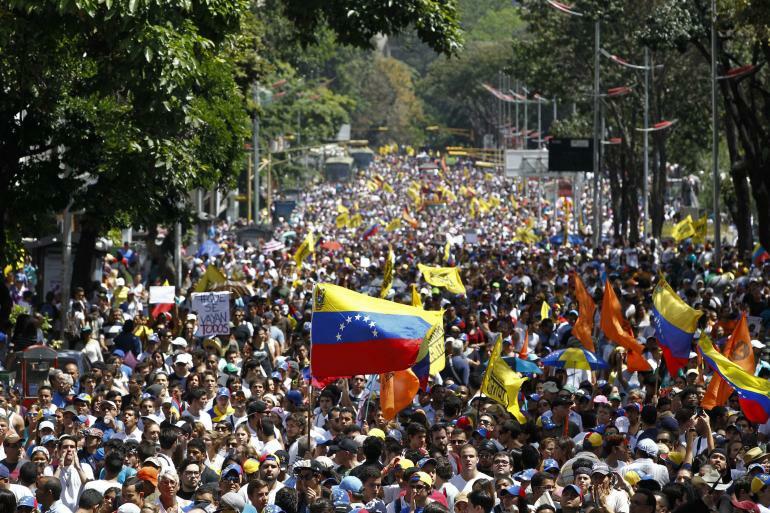 Were the 2013 elections in Venezuela rigged? It’s hard to say when the Venezuelan extreme leftist socially run media was portraying Capriles as a neo-liberal Zionist. Venezuela experienced 56% inflation in 2013, the highest in the world. Maduro has continued enforcing Chavez’s futile monetary policies that were enacted in 2003. The official exchange rate in Venezuela is overvaluing the Bolivar (Venezuelan currency) vs. the dollar. The high demand for the dollar, coupled with the shortage of the dollar, has created a black market that is further devaluing the Bolivar. The dollar is valued at 10 times the Bolivar’s official exchange rate in the black market- this is a prime factor in the extreme inflation Venezuela is currently experiencing. People are rioting in Venezuela because every day their salaries (if they even exist) are worth less, they can’t buy basic items (toilet paper, milk, sugar), an astronomical murder rate (1 person murdered every minute in 2013), the list continues. Production of food in the country is decreasing and foreign investors are reluctant to invest in a country with such high political and economic volatility. One of my former professors at Suffolk University is Venezuelan. I remember him explaining the economic situation in Venezuela and how difficult (almost impossible) it is to expatriate money from the country. The Maduro regime is continuing Chavez’s currency controls which may eventually cause hyperinflation (inflation of over 50% month to month). Maduro actually forced an electronics store to sell all of its products at rock bottom prices in order to swing positive opinion his way before elections. He also banned a Columbian TV station because they are encouraging the protests. It’s amazing how a country with the largest oil reserves experienced 56% annual inflation in 2013! ExxonMobil left in 2007 because this socialist government doesn’t understand that they can’t call the shots when they do not own the technology and/or means of production, which are in dire need in order to extract and refine oil from the complicated terrain. Venezuela should be a global Latin American powerhouse much like Brazil at this point. One can only wonder what state Venezuela would be in today if Henrique Capriles had won the 2013 election. Venezuelan leadership will eventually need to move from the far left to at least the middle in order to allow businesses to invest and create jobs and sustainable lives for its citizens. If the Venezuelan socialist leadership is not competent enough to create jobs with an ocean of oil in its back yard, then at least provide a comfortable atmosphere for foreign expertise to come to the “rescue”.